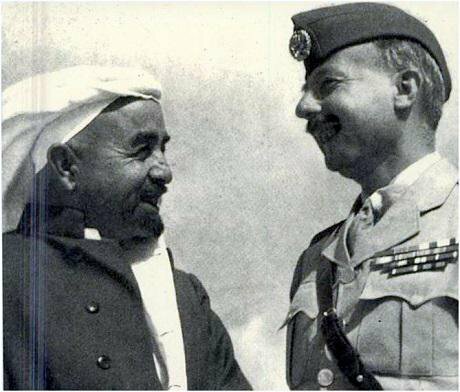 King Abdullah of Jordan and John Glubb Bagot. Circa 1947. Wikimedia Commons/War Office. Public domain. Abdullah I (1882-1951) was, as his name suggests, the first ruler of what became the Hashemite Kingdom of Jordan. Yet, his ascension to the throne of a new British protectorate did not mark the beginnings of young nationhood. Transjordan was not to be its own land, its own identity. This much was made clear by Adbullah I’s speech as he headed for Amman, the capital of his state. “All the Arab countries [were] the country of every Arab” because Abdullah was not securing a state but the first step in his pan-Arab, dynastic ambitions". Abdullah’s brother, King Faisal I (1885-1933) had secured Iraq as another Hashemite kingdom, while his eldest sibling, Ali bin al-Hussein (1879-1935) boasted (a very short-lived) rule over the Kingdom of the Hijaz, which would eventually become Saudi Arabia. Abdullah I’s ultimate goal was not to be Emir of Transjordan but to “[…] unify Arab lands under the Hashemite banner”, the crest of his house. To that end, Transjordan was not to be defined by a love of country but a love of king. And love of king was to be maintained through a loyalty system intended to consolidate disparate and hostile tribes under Hashemite rule. Abdullah I’s nationalism sprang forth from a context of religion, regional conflict and resistance to Ottoman rule, but left a lasting legacy to be inherited by Jordan’s current Abdullah II. This article explores how nationalism in the Arab world was born of militant resistance, from the Ottomans to internal struggles, and shows how Jordanian nationalism, specifically, continues to be impacted by history and fragmented by Abdullah I’s decision to centralize his rule via tribal loyalty. What would become of the Middle East and its respective states was a result of two World Wars, the collapse of Ottoman power and European interference. The belligerent context of the First World War was to become of great significance to Arab nationalism, defining it through resistance to a hostile ‘other’. A heightened awareness of ethnic identity at this time incited both Turkish and Arab nationalism to emerge. The prevalence of European enlightenment and libertarian ideas did much to encourage Ottoman Arabs to engage in an ‘Arab Awakening’, rediscovering their historical ethnicity that was distinct from Ottoman administration. As the Ottomans lost ground to Europe’s colonial powers, they tightened their grip on remaining lands. Combined with the inevitable march of the First World War, Arabs began to see the Ottomans as despots and Arab nationalism meant not only a rediscovery of ethnic traits but the need for independence through resistance. Arab resistance against Ottoman rule eventually crystallized into the Great Arab Revolt. The Revolt demonstrated one of the first regionally organized forms of resistance that tied Arab nationalism to militant opposition (against the Ottoman Empire). A direct response to Ottoman restrictions on Arab language and culture, the uprising was led by Sharif Hussein bin Ali (1853-1931), Emir of Mecca and father of the Hashemite Faisal and Abdullah, who would go on to rule Transjordan and Iraq, respectively. Hussein bin Ali’s leadership and military clout prompted Arabs to rally around the Hashemite cause and to bestow the same respect to the notion of Hashemite rule after 1918 across Transjordan, the Arabian Peninsula and Southern Syria. From this brief context, it is possible to see how nationalism began to form as both a pan-Arab (rather than state) identity and as a relationship between Arabs and family rulers (i.e. the Hashemites) rather than as a relationship between citizens and a single, bordered state. Indeed, the aspirations of Abdullah I and his subsequent (lack of) approach to national identity was a trait inherited from his father. This Arab state would be host to uniform traditions and religion but would also risk being ethnically fragmented, a trait that foreshadowed later flaws as Transjordan gained independence and a revealing new title: the Hashemite Kingdom of Jordan. In a sense, Transjordan was formed and ruled as an unwanted compromise by its first Hashemite. In 1920, Emir Abdullah was driven to restore his brother’s Syrian throne, in line with his and his father’s pan-Arab state. However, France’s mandate over Syria forced the Emir to focus on forming Transjordan’s first government and to shelve his dreams of a Hashemite Arabia. That same year, Emir Abdullah was declared ruler of Transjordan, a British protectorate. As such, the British carved Abdullah’s country into three distinct administrative provinces. These were: Northern Ajloun (with Irbid as its administrative capital); central Balqa (administrated from Salt) and the southern Karak region. It is worth noting that at the time of Adbullah’s ascendance to the throne, Karak was run by a distinct Arab Moabite government rather than by the Emir himself. Relying on financial and administrative assistance from British bureaucrats in Jerusalem, Karak suffered from weak Moabite relations with the tribes and from logistical gaps. Exemplifying such gaps was the lack of postage stamps and the means to print them; Karak received Palestinian stamps from Jerusalem and local values were written on them by hand. Over time, the Palestinian link would grow to symbolize an increasing source of tension in the attempts of modern Jordan to define its nationalism and who fit into the official concept of nationhood. Abdullah’s first government was established on April 11, 1921. Within two years, Transjordan gained state recognition and was officially transformed into the Emirate of Transjordan, with Abdullah I as Emir. By 1925, the conservative region of Ma’an and the Red Sea port province of Aqaba were officially incorporated into the country. Transjordan was gaining territory and defining its borders. However, the twenties saw a significant and repeated context; the end of the First World War, and the end of resistance for Arab unity in a region still in chaos and political fragmentation. Nationhood would not emerge without political cohesion, and for this Emir Abdullah turned to the oldest inhabitants of his deserts, the local Bedouin tribes. Nationalism in Transjordan was about to be born. Its roots would not be patriotism, but the need for stability and power. Abdullah formed personal networks that enmeshed disparate tribes to the monarchy via security and other institutions. The British-assisted Arab Legion was established to enforce law and order, further incorporating tribes into the state structure. In so doing explain analysts Mohammed Oudat and Ayman Alshboul, Emir Abdullah would promote a framework for nationalism that excluded the nation state. The importance of tribalism to Hashemite security would continue under successive Jordanian monarchs. Part two of this series reveals the fragmented nature of nationhood with the East/West Bank divide and tribalism.